Prepare to meet the sweetest robot ever created. Nuts and Bolts is an adorable blue robot made from a mixture of solid and glitter resins. Much like the tin man this little fella has a whole lotta heart. The focus on all those perfect little features is what makes this collection absolutely stunning and this fella has already sold out via Erstwilder's store. 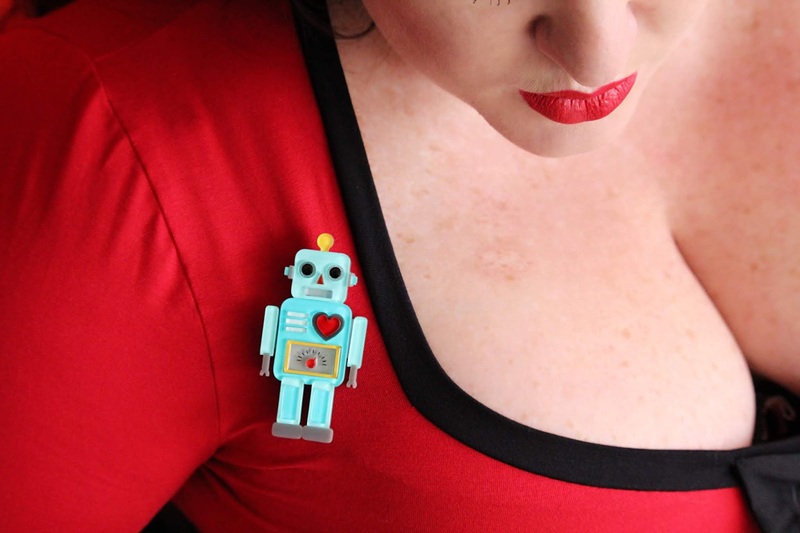 What do you wear to pair perfectly with this little robot? Bonsai Kitten of course! I'm forever fawning over the new arrivals section of their webstore and when I found the Candy top in red and black it had to be mine. Such a curve hugging and flattering shape for an hourglass figure. Made of a super stretchy fabric which is perfect for all year round wear. With a contrast neck trim and front bow your best assets will look absolutely amazing as this style shows a perfect amount of cleavage. I'm wearing a size 16 and it fits me like a glove. The soft fabric is a joy to wear and I honestly can't wait to wear this like crazy. 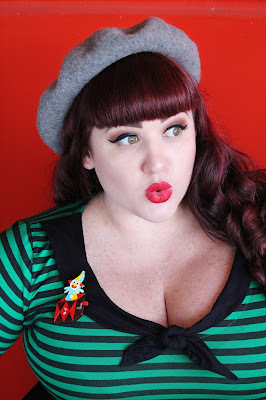 I'm so very in love with the fit of the Candy top and will be snapping up the black and white version as well as the nautical stripe colourway. When you find that perfect top, it's impossible not to own every single version of it. 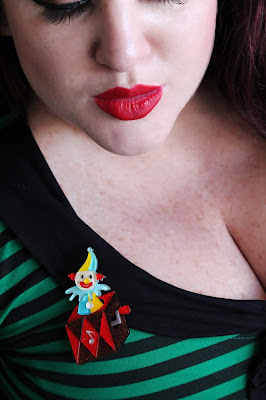 I've been dreaming of a jack in the box brooch for many years, and Erswilder has finally created the perfect version of this amazing little toy. More glitter and all the bright colours in this piece make my heart sing. No need to be scared by this little clown as he's not planning on giving you a shock but I dare you to look at little jack and not start singing the music! As Cranky Jack is full of bright colours, I wanted to pair him with a bold stripe to help him really stand out. The Geek Girl top in green was the perfect choice as it features a contrast collard neckline and tie. 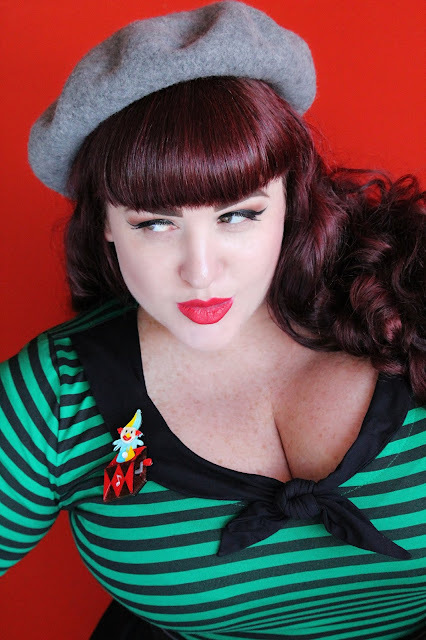 The perfect psychobilly twist on a classic pinup blouse and trust me this top is absolutely dreamy in person. From the moment you lay eyes up on this little wooden pooch you'll be in love! A classic chase along toy with the sweetest of features in glitter and solid resin. The use of red and yellow make this piece iconic and sure to be your best friend for many years to come. The pointy little nose, bright red wheels and those ears flying in the wind make this little tail wager one of the cutest canines I've ever snapped up from Erstwilder. I love the way his solid black body pairs with both coloured tops and simple black as it actually makes his features pop even more. Many thanks to my amazing husband for taking these shots and to my girl Liz for doing all of the post work.